Electric mountain bikes are no longer a new phenomenon. They have grown to become competitors and possible successors to the ordinary mountain bikes. 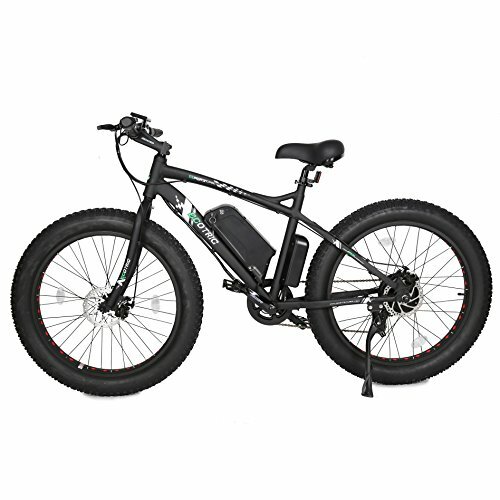 If you get really tired riding your mountain bike, then you need an electric mountain bike. 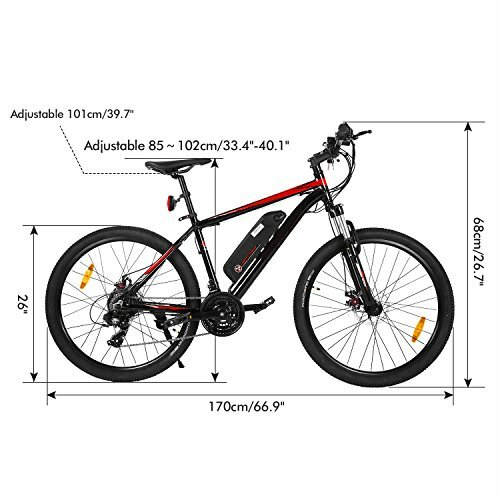 Selecting the right electric mountain bike requires you to have all the basic information that will enable you to filter out your list based on the specifications that suit your needs until you get the final result. The reason why this is important is because, getting the right bike will certainly make your riding experience exciting and worthwhile. In our Electric Mountain Bikes Reviews, we covered various electric bikes to help you pick the most suitable one with quality and in budget. This bike incorporates simplicity and coolness in its design. It is so easy to assemble yet when the parts come together, you get a simple but good looking MTB. This easiness of assembly, however, should not make you doubt its sturdiness. It has a very strong 6061 aluminum alloy frame that holds the bike together even as you speed past tough terrain. On the front of this frame are an aluminum handlebar and an SR suntour XCT fork with suspension that are very durable and give the bike a longer life. The bike does have a high level of comfort. It has a kindshock aluminum alloy spring suspension just below the seat. This combined with its comfortable addmotor seat give you a stable and leveled out ride even when you are on uneven ground. It has a 48 volt, 10.4 Ampere Hour Samsung cell battery which stores enough power to run its 500 watts rear brush-less motor across hills and rough terrain with ease. Powerful battery gives you up to 60 miles of range on level one pedal assist. It can carry a heavy load (up to 300 lbs.). Shimano rear gears give you 7 speeds. Front and rear lights improve on visibility at night. Comes in many colors (blue, green, yellow). It is fit for 5’5”-6’6” only. It does not have mounting holes for a bike rack. At first glance, you can see the sheer size of this bike’s battery. This powerful Samsung 48 volt, 13 Ampere-hour lithium battery packs enough juice to power its 500 watts, 48 volt motor through rough terrain, hilly ground, muddy roads or whatever else your biking expedition throws at you. The bike features a stainless aluminum frame that firmly holds the big battery and is strong enough to withstand heavy abuse. Its front tun gun fork suspension stabilizes your handlebar holding giving you more control and better handling. It has Shimano 7 speed rear gears that give you more options to work with when pedaling over different terrains. This extreme performance is comfortably put to a halt using its Tektro disk brakes that are effective for high speeds and durable as well. The bike features a cushioned saddle which is adjustable in 3 ways to give you comfort when you ride for longer distances or over uneven ground. Its Bafang motor is very quiet on the road/trail. A king meter LCD screen shows the battery and speed statistics. It comes fitted with all-purpose tires. Its heavy duty rims can withstand heavy battering. Excellent service and support from the manufacturer. The walk assist feature is too fast. For an electric bike, this is certainly an affordable one. In this case, however, cheap is not expensive. This bike’s features match up to its more expensive brothers. It has an aluminum alloy frame which gives it extra strength when tackling rough ground. Additionally, it has a carbon steel fork with inbuilt suspension that further increases the bikes strength and durability while also stabilizing and improving the bikes handling. For braking, the bike has front and rear disk brakes which have superior stopping power and come in handy when going down steep hills. It has a removable lithium battery which makes it convenient for recharging and replacement. This battery has a power of 36 volts and a maximum current output of 8 Ah and this is enough to give you a range of 50 km on a single charge. Its brush-less motor gives you just enough torque, enabling you to ride at the road legal 15 mph speed limit. Front LED lamp and rear reflector improve visibility. 21 speed gear system gives you enough options when pedaling. Height adjustable seat gives more options for people with different heights. It has wear resistant, anti-slip lithium tires. More customization in assist mode. It has an ergonomic design. Manufacturer support is not that good. This bike features a lightweight aluminum frame which makes it easier to control the bike. This frame is also strong and durable and combined with the bike’s carbon steel front fork, they allow you to continuously batter the bike without worrying about damages. The front fork contains the front suspension and this provides comfort and better handling over bumpy roads. It has a removable 36v 8 Ah battery that delivers power to the rear 250 watt motor. These two can run the bike for up to 50 km in range and can haul a person weighing up to 150 kg with ease. 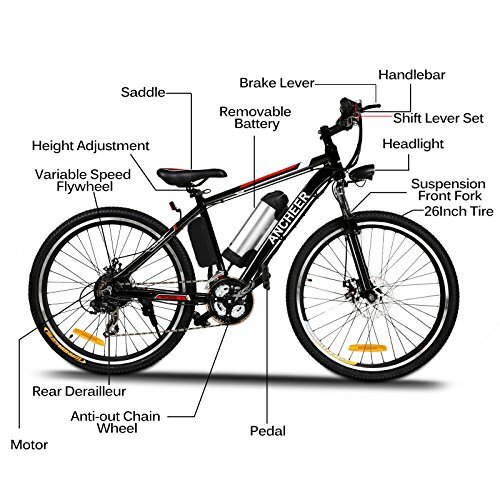 When you want to exercise or when the battery runs out, you have at your disposal durable aluminum pedals which do not easily break off and a 21 speed gear system that gives you enough speed options to tackle different terrains. It has all disk brakes to give you enough stopping power which keeps you safe and free from accidents. Fast charging technology fills up the battery in 4-6 hrs. It has simple to use twist throttles. It has customizable meter operations in assist mode. Bright LED headlamp and horn. Its complex controls can be difficult to use by a novice user. This bike was made with one major thing in consideration; ease of use. This ideology is seen in its quick release battery design which means that replacement is quite easy. It also has a quick release front wheel which drastically reduces the space required to store the bike. Its Shimano gears are very easy to use, making riding it a fun experience. To cap it all off, it is very easy to assemble. The time taken from assembling the first two pieces to tying up the last nut takes roughly 5 minutes, reducing the time taken before use and removing the need to spend more money paying someone to assemble it. This simple design is complemented by the bike’s good performance. Its 38v 8.8 Ah battery stores enough power to take you through roughly 30 miles on normal terrain. Its 250-watt motor is designed to go at a maximum 15 mph, which is the road legal maximum bike speed. The bike has a total of 21 speeds which come in handy when tackling different terrains. Additionally, the motor assists you as soon as you begin cycling, making it easier to cycle and to achieve high speeds in a short time. 3 levels of pedal assist give you more options. Fully sealed battery means that you can cycle in all weather conditions. Padded saddle and front suspension give you comfort. Disk brakes give you incredible stopping power. It has a stylish design. It does not have a headlamp and rear lamp/reflector. Design wise, this bike is as muscular looking as it gets in electric bikes. Its frame has a very wide form factor, making it look strong and powerful. This wide frame has another function which is to enclose the battery and protect it from collisions and the elements. This hidden battery has a power of 36V and produces a current output of 10Ah. This power is fed to a 500W driving motor that gives you a maximum speed of 23.5 mph. On electric mode only, the battery gives you a maximum range of 20 miles. It has a front display that shows you vital information such as distance, battery percentage and speed. In case the speed is too high, the bike has front and rear disk brakes that provide efficient braking power to slow you down, protecting you from accidents. On bumpy roads, the bike is equipped with adjustable front suspension and a padded seat that smoothen out vibrations, giving you a more enjoyable ride. It has a strong aluminum alloy frame construction. Powerful motor gives you more torque. It has a 5 level pedal assist system, giving you more cycling options. Its half twist throttle is easy to use. Its battery has a very long lifespan. It does not have a headlamp. The populo scout ebike is quite unique. It has an old, vintage-like design from the 80’s but still incorporates some modern vibe into it. Also unique is its motor placement. Unlike the other electric bikes, its motor is placed centrally, close to the pedals. It has a torque sensor that gives you an immediate boost when you pedal across difficult terrain. This motor is powered by a 36V 13Ah Panasonic battery that delivers a range of up to 28 miles on a single charge. The bike has a Shimano gear system that is powerful and easy to use. This system has 8 speeds and contributes greatly towards achieving the bike’s assisted top speed of 20 mph. 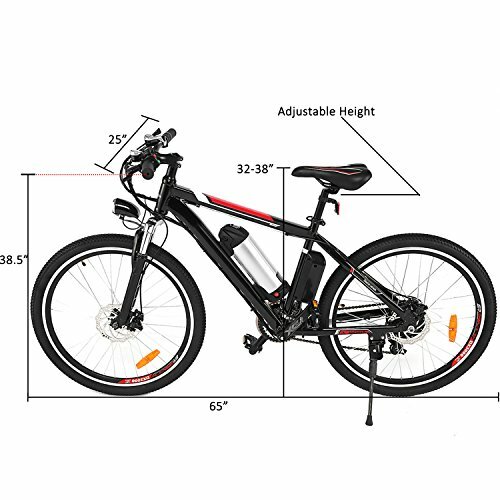 the bike has front suspension in its front fork and this coupled with its padded and ergonomically designed saddle, give you comfort and stability as you speed past uneven ground. Braking is not compromised because the bike features Tektro hydraulic disk brakes on both wheels, giving you the confidence to ride comfortably at fast speeds. It has a USB charging port. Powerful 350-watt motor delivers enough torque. It has easy to use controls. It has a big LED display that shows you all the vital information. It is available in two sizes. It has a 1-year warranty. It has a 30-day hassle free return policy. As the name suggests, this bike has fat (26” by 4”) tires that provide a bigger cushion from rough terrain and give the bike better grip. This makes the bike ideal for off-road excursions, riding on snow and on sandy beaches. These tires also give the bike a muscular look, making it have an appealing look. It comes in size 26” making it appropriate for people with a height of 5’6”-6’8”. On this 26” frame, a 36V 11Ah lithium battery is mounted just above the pedals. This battery supplies the bike’s 500 watt rear motor which in turn boosts your cycling. It has 1/2 twist throttle from which you control the amount of boost that you want as you cycle. This combined effort gives you a maximum speed of 20mph. Cycling is also made more comfortable with the use of a 7 speed Shimano gear system on the rear wheel. These varied speeds make riding uphill very easy and enable fast speeds on flat ground. Mechanical disk brakes provide superior braking performance. Its LCD screen shows you current vital bike information. It has a relatively short charging time (6 hrs.). It has a strong aluminum frame construction. The first 2 assist setting provides very little torque assistance. This foldable bike very portable which makes it ideal for people with tiny storage areas or those who do a lot of travelling. Additionally, it has a small 20” frame body which makes it even more portable. Despite its small size, the bike features a height adjustable saddle which enables it to accommodate people with different heights. It has an aluminum alloy frame construction which is strong enough to carry 350 lbs. Its front fork is made from carbon steel which is strong and durable, giving the bike a longer lifespan. On its frame, a 36V 8Ah battery is mounted just below the seat. This battery is used to power a 250 watt AMA brand rear motor. Combined with pedal assist, the two power sources give the bike a range of up to 35 km. It has 3 LED lights which show whether battery is full when the green light is on, half full when the orange light is on and empty when the red light is on. It has a rack making it more practical. It has a fast charging time (5-6 hrs.). Its saddle is padded for comfort. It has a long stem, enabling you to ride in an upright position. Its front V brakes and rear expansion brakes do not provide superior braking performance. Does not perform well on steep slopes. This bike has a slim form factor which makes it look weak but that is not the case. Its frame is made from an aircraft grade aluminum alloy which makes it super strong and durable. Additionally, it has double walled aluminum alloy wheels which makes them stronger and because aluminum is lightweight, this bike is very easily maneuverable. Its front fork is made of steel which is strong enough to take first contact vibration on the rough ground from the front wheel. This fork has a suspension system which shields you from uncomfortable vibrations, giving you a more stable ride. In terms of power, this bike is well equipped. It has a 36V 8Ah LG lithium-ion battery which powers its 250-watt brushless motor. This battery stores enough power to give you a range of 40 miles on a single charge. It has 3 pedal assist modes which provide varying levels of assistance to suit your needs. 2-year warranty for the battery, charger and motor. Its battery is removable. Can be charged on or off the bike. It has a 21 speed gear system, more than enough for all kinds of terrain. Front and rear mechanical disk brakes provide superior braking performance. This is the most important component in an electric MTB. It is what powers the bike, thereby separating it from a normal MTB. When considering buying an electric bike, you need to look at two things: battery placement and battery capacity. Mountain biking requires more power than other forms of biking. Therefore, a more powerful battery is better. Their power is measured in Volts (v) and Ampere Hours (Ah). The higher the rating, the better. The battery is one of the heaviest components in an electric MTB. Therefore, in situations where you require maneuverability, it would better to have a centrally and lowly placed battery to lower the center of gravity when navigating sharp corners. For instance, a battery placed on the downtube would be better off than one placed on the top tube. A motor converts the electric charge in the battery into torque, which propels the bike forward. The best electric mountain bikes usually have their motors located at the cranks. This mid-motor design is more efficient than rear or front hub placed motors because of one particular reason; front and rear placed motors affect the bike’s handling and this might affect your riding experience. Rear placed motors are very common and though this is not as efficient as mid-motors, it is better than front hub placed motors. Aluminum alloy frames are one of the best frames builds in the market. Although other better ones exist for instance carbon fiber frames, they are expensive and repairs such as welding cannot be carried out on them. Instead, a whole new frame would be required in case part of the frame cracked. Alloy frames combine sturdiness and lightness to give you more balance and maneuverability when mountaineering and you should make sure you do not forget to consider this before buying your bike. Most e-mountain bikes come equipped with an LCD or LED display to show you information such as battery status, speed, distance covered and pedal assist levels. This information is important for you as you plan your mountaineering excursion and also helps you make adjustments along the way, for instance, to reduce pedal assist so as to conserve battery charge for the upcoming hilly terrain ahead. Therefore, you should consider buying a bike that has this dashboard display. Mountaineering will definitely include going through tough terrain. The vibrations passed on to your body from such terrain would be very uncomfortable. To avoid all that discomfort, better buy a MTB with front fork suspension and rear spring suspension. Adjustable suspension is an even better option. These give you the option of adjusting the rebound force, which lets you tweak the level of “bounciness” that you want. Mountain bikes have various types of brakes. These include V brakes, expansion brakes and disk brakes. V brakes and expansion brakes are generally cheaper and they give you good braking performance. However, mechanical disk brakes give you better braking performance and this is particularly useful because modern Ebikes move at very fast speeds. Their only drawback is that they are expensive. An even better one is the hydraulic disk braking system which offers superior stopping force. Be sure to check out for models such as Tektro, Shimano and SRAM because these are some of the best brake manufacturers. A transmission system is not unique to electric MTBs. However, a reasonable number of gears will give you variable speeds to tackle different terrains. The more the speeds, the better and you can check this by looking at the rear cassette and crank. If they have multiple sprockets, the bike has different speeds. Good quality gear systems include Shimano and SRAM and you should consider these well-known brands because they are of high quality. In mountain biking, bigger tires are always better than slimmer tires. Bigger tires give you a bigger cushion from rough ground and this protects your rims and gives you more comfort. Also look for tires with big treads because you will need a lot of grips when you go off-road. Such tires give you more control and better handling. Additionally, look for tubeless tires because they are less susceptible to getting flats as compared to tube tires. 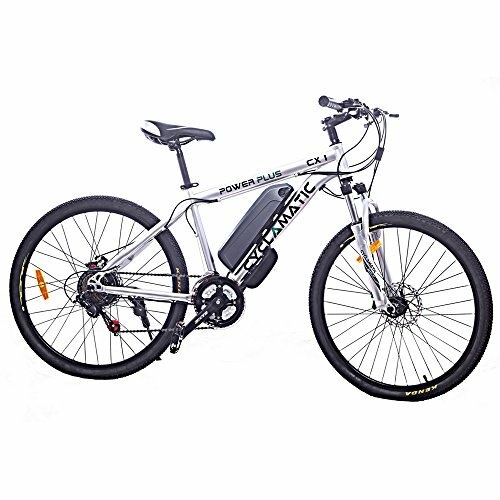 After going through and considering all this information, it is quite easy to select the best electric mountain bike that suits your needs. If you are a fast and aggressive mountain biker, you will probably require the best of everything (largest battery, most powerful motor, big tires etc.). If you like taking things slow, then you will probably need a toned down version of everything so as to save on cost. Other variations of riders that fall in between the fast and slow riders should balance out what they really need and compare the cost before buying their ultimate MTB.